The "weaponization" of ACO narrow networks: Strategic destabilizers which compel their own replication? - Recon Strategy - The “weaponization” of ACO narrow networks: Strategic destabilizers which compel their own replication? They are more likely to achieve broad utilization reduction because participating providers can align on principles, build shared capabilities and coordinate management of specific patients consistently. As a result, discounts can play a smaller role in creating a compelling value proposition for the plan sponsor, preserving better economics for the participating providers via a shared risk / joint venture mechanism. Given the need for coordinated approach to patients, orchestrating providers will have more of a say about who is in or out of the network, which makes it harder for initially non-participating providers to “buy” their way in via discounts should they see share erode and decide they want to join after all. Up to now, it has been possible to discount the threat because narrow networks lacked broad-based appeal: limited choice was too great a blemish in consumers’ eyes (especially when employers are footing a good part of the bill). Kaiser, for example, has had a longstanding, major share in California, but one that has remained fairly stable over the years. Share of commercial insurance revenues went from 32% in 2009 to 34% in 2013 and their share of Medicare Advantage lives has been about 45%-46% over roughly the same timeframe. 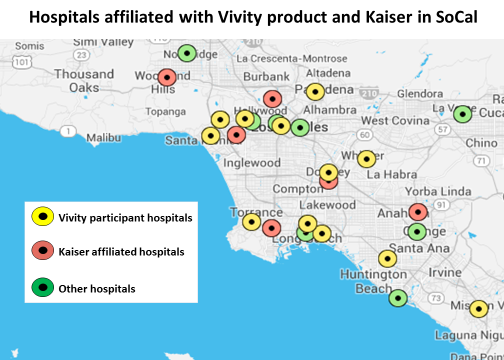 Few providers in Kaiser’s markets have felt a need to replicate the Kaiser model in benefit design (although many providers in California do operate substantially at risk for their populations). Now, however, the ACO narrow network is getting “weaponized” by defined contribution / private exchanges, giving consumers financial incentives to choose more limited access. Sharply increased cost exposure should make these products attractive for a much larger share of the market. Forecasts for private healthcare exchange (PHIX) uptake appear to be coalescing around 25-30% of the market in next 4-5 years. Kaiser will no longer have such a segmented appeal when patients are footing the full difference in pricing. If there is an ACO narrow network offering in a market, the rest of the providers, especially high end providers who are unlikely to qualify for a “budget-friendly” narrow network at their current rates, will need a response or risk seeing a lot of patients disappear. This logic explains why I think California providers appear to be more interested in linking ACOs with narrow network products. Most visibly and just last week, Anthem was able to assemble and launch Vivity positioned as a counter to Kaiser. The participating provider systems structured the program as a joint venture which should give them strong influence, if not control (“provider-orchestrated” after all), over which other providers join, how the lives are managed, and how the economics (no doubt driven in large part by discounts offered by the providers) are allocated. Economic calculations premised on pulling back referral care now done outside your system should, over the longer-term, anticipate that referral care you do for patients of other providers will be pulled away from you. That may not be enough to change the logic of being a first-mover (which should be based not on today’s baseline but the one you will face tomorrow), but may change your financial forecast and decisions about capacity management. The logic driving proliferation of ACO narrow networks in a market will create a “positive feedback” loop for the growth of narrow networks. More networks means more options means more consumers will find a network option that suites them, which makes the narrow network play that much more compelling for providers to participate. * = The picture is a bit more complicated because a few PSHVN participants overlap across the S/P and UW narrow networks (for example, Everett Clinic is in the S/P network and Overlake is in the UW network, while both are part of the PSHVN product). Further, the First Choice Health channel is owned by several major providers in the Seattle area, including Evergreen and Overlake but also S/P and UW. Perhaps everyone, including S/P and UW, recognizes that ACO narrow networks can be destabilizing and it is best to support a return to strategic equilibrium.